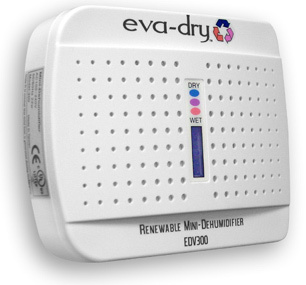 Eva-Dry Mini-Dehumidifier - 300 The Eva-Dry Mini-Dehumidifier is 100% renewable and will not spill or damage valuables. It needs no power or batteries to operate. This unit is perfect for removing moisture and keeping small, closed areas dry. 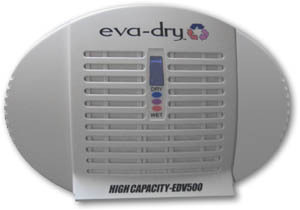 Eva-Dry Mini-Dehumidifier - 500 High Capacity This high capacity renewable dehumidifier has been designed to adsorb moisture from small, enclosed areas. It will help protect clothes and valuables from the damaging effects of mold/mildew and moisture rot. It is 100% renewable and needs no power to operate. Just hang the Eva-dry unit in a closet, or you can place it in other small, enclosed spaces, and it will start to adsorb moisture. There are no batteries required or cords to plug in, the unit works without power. 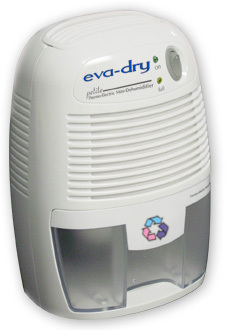 EDV-1100 Eva-Dry Electric Dehumidifier The Eva-Dry Electric Dehumidifier is perfect for larger, damp areas but is small enough to easily fit on your desk or workbench. It extracts the moisture from the air and stores it in a spill-proof reservoir. Just plug it in it it quietly dries the air.